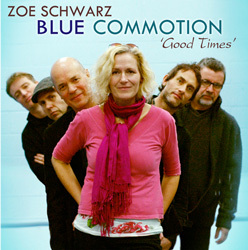 Zoe Schwarz Blue Commotion is a six piece band which contains members who have worked with the likes of Nina Simone, Van Morrison, Paul McCartney and more. Described as "a contempary six piece blues band" in the press release I was expecting some fairly traditional blues, but this album is far more than just plain Blues music - there's a really strong Jazz feel to it as well. This meeting of Jazz and Blues means that what you get here is really interesting and very enjoyable music to listen to. The album contains 14 tracks with roughly half being original songs and the others being cover versions of songs from Billie Holiday, Willie Dixon and more. The music here is excellent - there's some superb guitar work, and some fantastic Hammond Organ - an instrument that has such as distinctive sound. Great music though is no use unless the vocals are good, but there are certainly no worries there - Zoe Schwarz has an amazing voice - think Shirley Bassey, Billie Holiday and Nina Simone combined. The songs are quicker paced and more uptempo than you'd expect from blues, but Zoe's voice really keeps this album firmly rooted in the Blues camp. It's an excellent album that Blues lovers and Jazz lovers alike should certainly check out.